Horace Langford Jr./Pahrump Valley Times Freshman Christopher Vega battles a Mojave defender for the ball during Thursday's game in Pahrump. 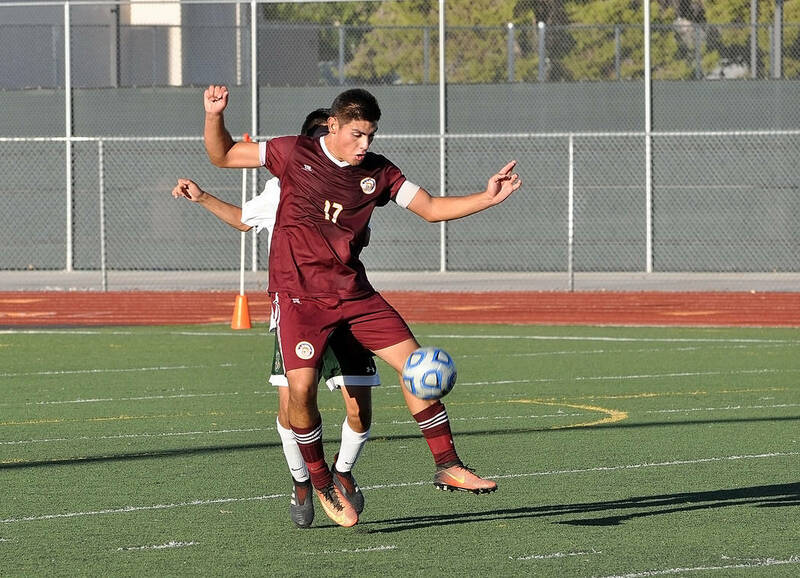 Vega scored the winning goal in the Trojans' 2-1 victory. Horace Langford Jr./Pahrump Valley Times Senior midfielder Jose Chavez controls the ball in front of a Mojave foe on Thursday during Pahrump Valley's 2-1 home victory last Thursday. Horace Langford Jr./Pahrump Valley Times Christopher Vega finds room to maneuver against the Mojave defense during Pahrump Valley's 2-1 victory last Thursday, the Trojans' third consecutive win. Horace Langford Jr./Pahrump Valley Times Sophomore Vincent DiBlasi goes up for a header Thursday during Pahrump Valley's 2-1 win over Mojave that opened Class 3A Sunset League play for the Trojans. 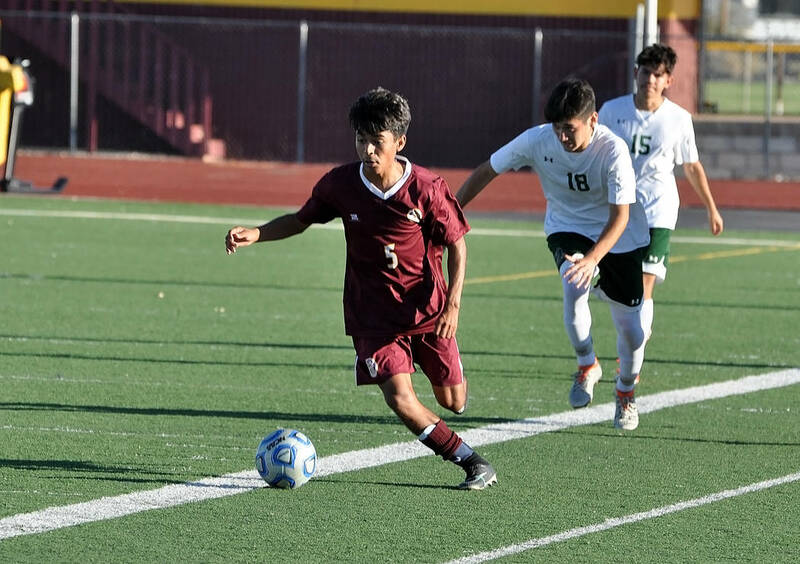 The Trojan freshman scored off an assist from Alvaro Garcia in the final minute Thursday to give the Trojans a thrilling 2-1 win over Mojave in their first Class 3A Sunset League match of the season. 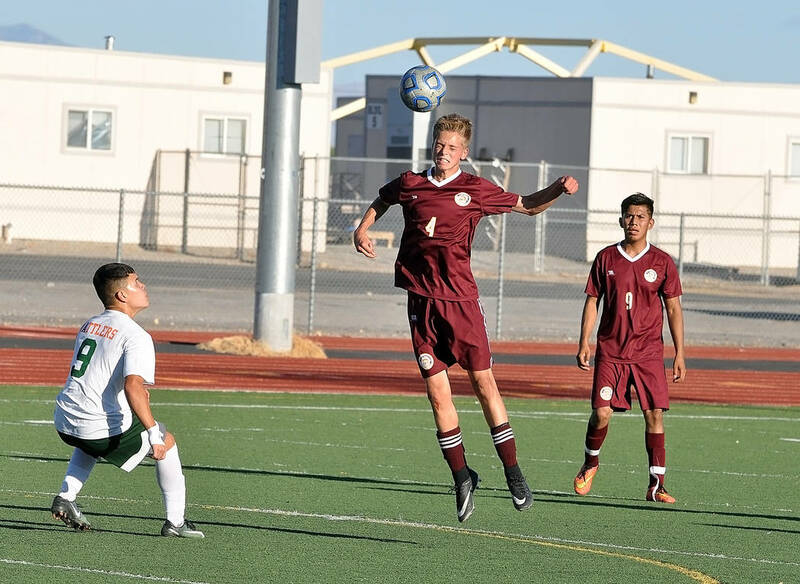 From his vantage point, Pahrump Valley goalkeeper Ian Kingsley figured the game was in the bag. Kingsley deserved to feel confident in the closing seconds, because for several minutes before that he was tested several times by the Rattlers. If the Trojans (3-3, 1-0, 3A Sunset) were praying for high-quality goalkeeping, they got it from Kingsley. And if they were praying for a bit of help from the crossbar, they got that, too, as they spent much of the second half clinging to a 1-0 lead. In the 63rd minute, Kingsley made a solid save on a low-line drive during a sequence in which many players on both sides were not aware the ball was back in play. Less than two minutes later, a point-blank shot hit the underside of the crossbar. Another diving save by Kingsley on a shot from 30 yards out preserved the shutout, and when a strong corner kick was headed over the crossbar moments later, it seemed as if the Trojans already had dodged their fair share of bullets. But the Rattlers (2-1, 1-1) tied the game with about five minutes left, as senior forward Felix Perez scored his third goal of the season, sliding a shot on the ground just inside the far post to get the visitors on the board. To hear the Trojans tell it, in the past they might have taken the tying goal as a punch in the gut, passed around blame and folded. But they say this is a different group. “It’s that belief in the team, helping each other, never giving up, persevering and just doing their best,” Pahrump Valley coach Chris Robert said. In the closing minutes, the Rattlers continued to press the issue, testing Kingsley from all over the field. Just two minutes after the tying goal, a rocket from 40 yards out-hit the crossbar. While the crossbar did help the Trojans, Kingsley was outstanding, and he saved one of his best efforts for the final minutes. Moments after a potentially dangerous header went high over the crossbar, the junior keeper punched a well-struck shot high in the air, then alertly hustled to gather it in. Moments later, Vega’s goal set off a wild celebration. 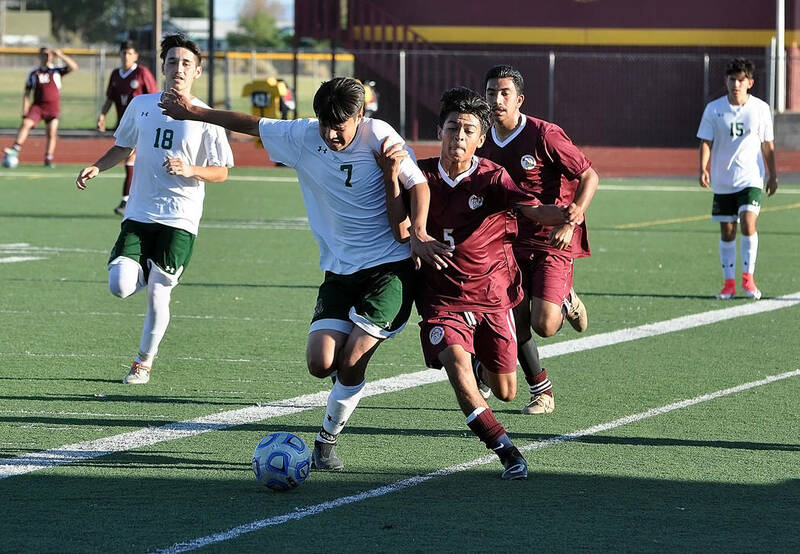 The Trojans had taken a 1-0 lead less than five minutes into the second half when Fernando Martinez-Fontana scored after being set up nicely by Christian Gonzalez. While many of the players point to intangible reasons why this year’s team has a different feel, Roberts also has some more concrete factors in mind. “Our defense is a lot better this year, and I think we’re going to be hard to score on,” Kingsley said. Indeed, after opening the season with losses against Palo Verde, Desert Pines and Centennnial, three Class 4A schools they faced with several players out of the lineup, the Trojans have allowed just two goals in victories over Virgin Valley, Boulder City and Mojave. And yet, the intangibles keep coming back into the conversation. Pahrump Valley 7, SLAM Academy 0: On Monday, the Trojans (4-3) made it four in a row with an easy victory over the Bulls (2-6), a second-year team playing an independent schedule. Football: Senior Nico Velazquez scored on a 28-yard run and ran for the 2-point conversion to give Pahrump Valley a 28-20 lead late in the third quarter, but Boulder City (2-1), led by Thorsten Balmer’s 211 yards rushing, scored twice in the fourth quarter to hand the Trojans (1-3) a 32-28 defeat on Friday night in Boulder City. Meanwhile, in Beatty, Jacob Henry and Fabian Perez each rushed for two touchdowns and Yadir Rodriguez returned a kickoff 85 yards for another score as the Hornets opened their season with a 34-6 rout of Trona, California, on Friday night. See full coverage of both games in Friday’s Pahrump Valley Times. Girls Volleyball: Another Pahrump Valley team opened league play successfully as the Trojans routed Democracy Prep 3-0 on Thursday. Kate Daffer posted six kills as the Trojans won 25-9, 25-6, 25-17. Boys Cross Country: Junior Michael Sonerholm finished the 3-mile course in 17 minutes, 11.5 seconds to place 11th and lead four Trojans among the top 30 finishers as Pahrump Valley finished second in the Varsity A Small School race at the Larry Burgess Invitational on Saturday at Sunset Park in Las Vegas. Senior Jacob Cipollini (17th, 17:43.3), junior Grant Odegard (18th, 17:44.2) and freshman Seth Sonerholm (26th, 18:30.0) helped the Trojans finish with 83 points, nosing out Moapa Valley’s 86 for second. Girls Cross Country: Junior Diamond Sonerholm finished in 10th place in the Varsity A Small School girls race at the Larry Burgess Invitational. Sonerholm covered the 3-mile course in 20:47.6, roughly two minutes ahead of senior teammate Katherine Goodman (17th, 22:42.6). They were followed by sophomore Patricia Roundy (24th, 24:07.1), junior Terrena Martin (26th, 24:26.2), junior Nrsinga Breathwaite (32nd, 25:34.4) and freshman Beverly Roundy (54th, 32:52.6). The Trojans finished fourth with 98 points. Girls Golf: Breanne Nygaard shot an 85 and Makalea Petrie finished with an 87 to pace Pahrump Valley’s effort last Tuesday in a Sunset League match at Las Vegas National. Nygaard placed second and Petrie third behind Carolyn Lemon of Western’s 80 on the par-71 course. Jessica Pearson (103) finished fourth, Alex Norman (116) tied for fifth and Anastassia Furman (126) placed ninth for the Trojans, who were the only full team in the field that also included golfers from Mojave, Valley and Del Sol.